Here is an example of a great itinerary our friend Dominik and I worked on, and I think it was a great little holiday for him. Dominik would like to share his story with you and we hope it will inspire you to create your own great tour! Thanks for the pics too Dominik! If you would like to share your great tour story, just click here. Hi! My name is Dominik and I am from Germany. I have just returned from spending 10 weeks in Canada and would like to share some highlights with you. The majority of my stay was spent in Canmore attending a language school, making friends and touring the local sights. I decided to try living as a Canadian and stayed with a terrific homestay family, making my trip a true cultural experience. At the end of my stay in Canmore, I thought it would be nice to make a one-week trip to British Columbia and the West Coast. I contacted Marcel and together we built the following itinerary. Remember that this itinerary is based on my personal interests and time-frame but I am sure anyone could adapt this to make a great trip! I was in Canada in April and May, a shoulder season, and places were not as busy as in the summer months. Thanks again Marcel for your support. Without your help I would have spent much more time searching for good locations. I had a great trip! I decided to pick up my rental car on the Sunday so I could have an early start from Canmore on Monday. But while picking up my rental car at the Calgary International Airport, I got my first shock. They charged my $300 CAD extra for gas, drop off fee and tax, even hough I had told them that everything was included in my contract. However, after some investigation at home in Germany, I found out that I'll get the money back. The Spiral Tunnels: My timing was great - I saw the train! As the train is coming out of one tunnel, you can see the tailend entering the lower tunnel. The Spiral Tunnels were built between 1907-1909 and they are considered to be an engineering feat! 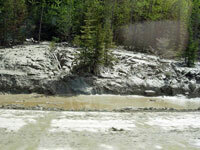 Mud Slide at Rogers Pass: Okay, this was not a planned stop! You never know what Mother Nature will bring you on your holiday! I was lucky that I only had to wait 20 minutes! Rogers Pass Information Centre: This is a great spot to learn more about the "Snow Wars" and how man has tried to win the battle. The Giant Ceders: This is a great reason to get out of the car and stretch your legs. 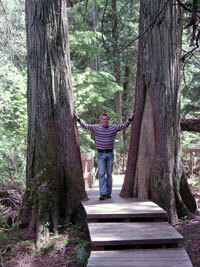 Follow the boardwalks through a towering forest of ceders and smell the crisp forest air. This was really worth a picture! 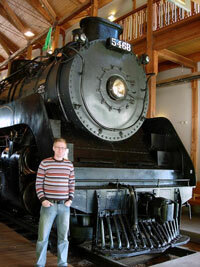 The Railway Museum in Revelstoke: This is a neat little place in a great building. Here you have the chance to go back to the past and see how trains provided such an essential mode of transportation in Canada. You can learn about how the railway was built, who the workers were and how the railway operates today. Great stop for all of you railway buffs! Crazy Creek: This was CRAZY!! The picture says it all! 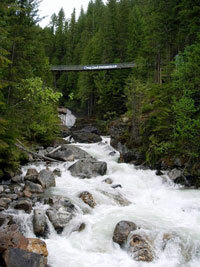 Crazy Creek Waterfalls and Suspension Bridge is located on the Trans Canada Highway, about 33 km east of Sicamous and 38 km west of Revelstoke, British Columbia. 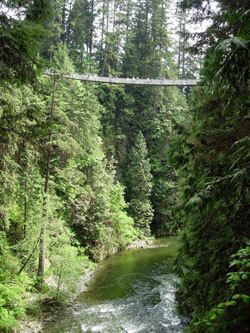 Boardwalks take you on a short walk to viewing platforms where you can see the incredible gorge and of course the suspension bridge. The two waterwheels are also pretty neat! Definitely worth the stop! Generally it was a great and scenic drive. I spent that evening and the next morning visiting Kelowna and since it was low season, so it wasn't so crowded. On the second day I drove all the way to Tsawwassen on the west coast to catch my ferry. I arrived after sunset, and it was very hard to find my accommodation without any street lights. Instead of sleeping at my usual accomm (hostel), I had booked a little cabin at a lake because I knew the hostel was closed. (It pays to do your homework!!) 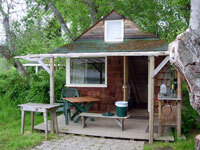 The cabin was great with a view of solitude. 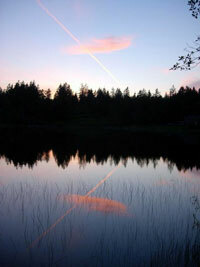 So I spent two nights at Salt Spring Island and had a great time hiking, kayaking and relaxing. Maybe I relaxed a little too much - I was lucky to get on the ferry even though I was 10 minutes late!! My car was the last one on. Arriving at Schwarz Bay I drove straight to Butchart Gardens, fifty-five acres of flowers which all started in 1904, when Jennie Butchart began planting in an old quarry. What can I say - it was incredible. I've never seen such beautiful gardens before. After visiting the gardens I drove to Victoria and checked into the hostel. 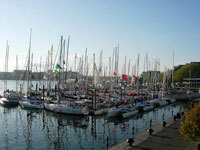 It was a beautiful day, so I went down to the Inner Harbour and walked around. 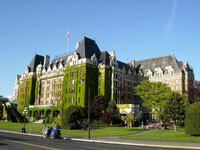 The harbour is of course where everyone first goes to catch a look at the beautiful Fairmont Empress Hotel. I of course had seen the Fairmont Banff Springs in Banff and this hotel is just as beautiful in an entirely different setting. The Empress claims that during the summer months, they serve Afternoon Tea to more guests than most hotels in London, England. Can you imagine? 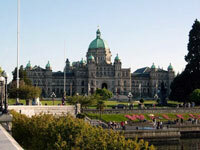 Then there is of course the BC Government Parliament Buildings which overlook the boats in the harbour. Take advantage of the two level waterfront walk-way and take a stroll! Downtown Victoria is not too big, so you can walk to many good spots. The next day I visited the Royal BC Museum which was very interesting. I was lucky because "The Titanic: The Artifact Exhibition", which had begun 95 years to the day after the sinking of the "unsinkable" ship, was still showing! In the afternoon I drove out to Sooke Regional Park and took a nice long walk for a couple of hours. Back at the hostel, I made dinner and the evening ended at the bar in the hostel with some interesting conversation. On Saturday morning I got my stuff ready to drive to Departure Bay. 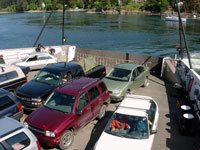 However, the traffic was much more than I had expected, so I missed the ferry and had to wait for the next one. From there I took a BC Ferry to Horseshoe Bay. Then I made the decision not to drive directly to the hostel in downtown Vancouver, but instead drive to Capilano Suspension Bridge and Grouse Mountain which are on the way to Vancouver. The suspension bridge was fun. It was very shaky and it was funny to see the all these people trying to walk across the bridge without using the hand rail. Later I hiked up Grouse Mountain. I've never walked/hiked up so many steps before. You think the end is just after the next corner - that is when I saw the sign for the half-way mark! I was very exhausted at the top, but I did it in exactly one hour. 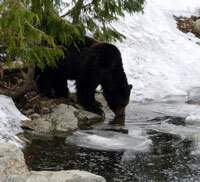 On the top there was still some snow, and I saw an eagle show and of course the two Grizzly Bears, Grinder and Coola who now live in the 5-acre grizzly habitat at Grouse Mountain's Refuge for Endangered Wildlife. The view over the city was amazing. 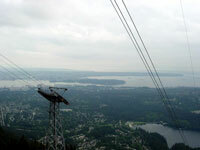 My Swiss friend had shown me some pictures of Grouse Mountain when he was there in December. I know I have to come back in the winter to see this view! On Saturday night I went out to discover the city with an American guy from the hostel and had a fun evening. On Sunday we went together to Stanley Park and visited the Aquarium and the park. The weather was beautiful, and we had a gorgeous day. The rest of the day, I walked around the downtown and visited the typical sightseeing attractions. I can definitely say that I like the city and I'll have to come back. On my last day I bought the last gifts and continued the walking tour, although my legs were so sore that I was actually glad to relax in the plane. On the way to the airport I visited UBC. It was unbelievable. The University is like a city in the city. On the Monday there was an alumni event on the campus with a lot of people. It was nice to see all the students in their black robes because we don't have this at my University in Germany. I only know it from the movies. After visiting the University, I drove to the Airport, dropped of the car and had to wait for my plane. Unfortunately I didn't get an upgrade for business class (again!) and so I had to sit next to some old ladies with weak bladders. But after some wine, I got some sleep. In London I had to transfer and we had an hour delay but it was ok. So that was my one-week trip from Calgary to the West Coast! I hope you can identify some spots on the pictures and I can say that the 10 weeks in Canada have been the best in my life. The first week at home was very hard and I still miss Canmore and the Rockies. Thanks again Marcel for all your support and when I come back to Canada, I'll let you know! Great Tours Through the Canadian Rockies! 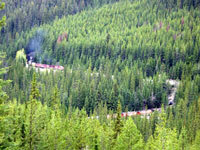 Have you embarked on any great tours through the Canadian Rockies that you would like to share with our readers? Which route did you take and why? What were the highlights? By rail, car, motorcoach or motorhome - we'd love to hear about your experience on how you made your dream vacation a reality! Your story will appear on a Web page exactly the way you enter it here. You can wrap a word in square brackets to make it appear bold. For example [my story] would show as my story on the Web page containing your story. Your entry may be editted, shortened or lengthened for clarity.